In case you have been hiding under a rock this week it won’t have escaped your notice the western world is in the grips of “Black Friday” fever! Deals are flying at you from all angles and it would be so very easy to get swept up in the hysteria of grabbing a bargain. However, can I suggest a word of caution….and even possibly a halt on all proceedings until you have sat down and written a list of the items you actually NEED so that the buying frenzy at least has some element of focus! Hopefully, this way you will then grab a real bargain as opposed to something good value but is actually worthless to you since you don’t need it/have nothing to wear it with / have no occasion to wear it to! 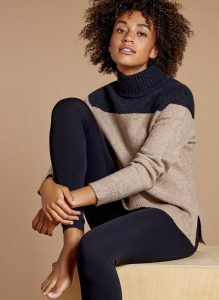 So, now for the advice on what to buy from the fabulous Baukjen – a perfectly timed blog to coincide with their Black Friday sale and one that will hopefully help you to know what would work for you from their collection. The way I approach sale shopping, and what I advise all my clients to do, is obviously write a list of what you need…but also a list of what you might like to invest in that might usually be out of your price range. Items that would really add a wow factor to a simple outfit, or a timeless piece that will go with so much in your wardrobe and give another dimension to it. This way- if you spot something fabulous amongst the plethora of choice you can make an informed decision about it as you have already done the thinking and justifying behind it already. I have picked a range of pieces- some that are investment, some that are classic and timeless and others that add a little je ne sais quoi to an outfit. I have seen this coat “in the flesh” and I can vouch for the quality and its appropriate weight…ie it feels substantial but not overly bulky. It is made of printed leather – but there is a fur texture to it. 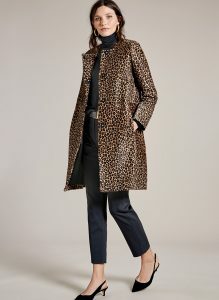 I could wax lyrical about the endless possibilities of where and how you could wear this coat as it is one of those pieces that lends itself to so many situations. I can see it being an item that grows up with you; you wear it to so many occasions but you truly don’t care if people have seen you in it before- it’s just “your coat” that everyone associates you with! A word of caution for petites and anyone who is very curvy or full busted as the fabric is not massively flexible- so could end up either slightly swamping you – or bulking out around your curves. However, it could well soften over time as all leather does. If you don’t already own a biker jacket this one would be a great place to pop that cherry! A biker is a timeless piece that gives a boost to so many outfits and always ensures you feel “current” but not necessarily a slave to fashion. If you are broad shouldered or very full busted you would need to be careful with a style like this as they can add bulk where you don’t want it. However- you could always try a suede version instead which would have more flexible fabric? 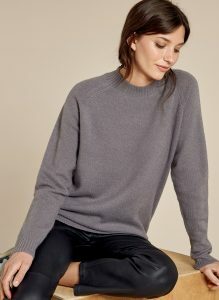 Wear with waisted dresses, with jeans and a simple jumper, over cashmere for a more luxurious look, or possibly with a jumpsuit- honestly…there is very little you couldn’t wear it with! This colour way would suit anyone with a warm skin tone and looks great paired with creams, browns, navy, black, forest greens. A timeless piece that you will get so much wear out of. I love a block colour jumper…and the colours used in this one are just a delicious combination! Great quality, elegant, simple, clean lines…you can’t ask for much more. The colour way would suit those of you with darker colouring due to the black section being next to your face. It would work well for those of you who are broad shouldered as a darker colour in that area will make them look narrower. Another colour I just adore….it looks good on everyone, especially with a pop of white collar just showing from underneath- so elegant. Good quality, will go with lots of items as it’s in a neutral colour so giving you great value for money. I have this top so can totally vouch for the brilliant quality of it as well as the fit. It is not overly “tummy hugging” and is a really good, thick cotton…more then a tee-shirt, less thick then a jumper! The colours would work well for anyone with a warm skin tone and particularly good for those of you with soft colouring as it’s tone on tone. I love the fact it is a different breton option from a navy/white one. I love mixing Breton stripes with other prints such as leopard print and floral. I would probably draw the line at pairing it with spots though- otherwise you could be straying into children’s tv presenter territory!! A breton doesn’t always have to be “classically classic” – think about putting it with a blazer, skinny leather trousers and trainers; classic but with a twist…it will be a great staple in your wardrobe for a long time. A simple tee shirt with some brilliant detail if you are bottom heavy as the ruffles on the shoulders and bust will build up your top half and make them appear bigger/broader. The forest green colourway is great and I purposefully chose the image of it with the leather jacket to show the colour-combination idea. A classic and timeless piece – I would describe this as a “parent” item in your wardrobe…a cornerstone of so many outfits. This is another example of the perfect piece to invest in at sale time. It won’t date, is a classic cut so will always be flattering and will dress up any outfit. The single-breasted cut works for everyone and has stretch in the fabric so should be kinder to a full bust. However, be careful if you are broad shouldered as this cut could make them look wider since it is tailored. I have a 20% discount code (KE20) that can’t be used on sale items but if you see anything else that catches your eye…it will soften the blow! I hope my advice has given you food for thought and more importantly- the ability to make a more informed decision as to what you are buying? Please let me know if you have any questions. My next blog for Baukjen will be in January when they are releasing their first drop of their spring collection. I thought it might be helpful to pick items from their collecting that would help to solve (or at least be more flattering) for challenging areas of the body such as a full bust, shorter legs, tops of arms you want to hide etc. I also wanted to say a huge thank you to all of you who contacted me to let me know your thoughts on my working with the team at Baukjen. I SO appreciated you taking the time to get in touch and more importantly – of being so supportive of the role I play when working with brands. It was such a boost to read your comments and to get confirmation that the angle I come from and the advice I give actually really helps you to buy with consideration and more knowledge. This was just the most brilliant thing to see in black and white; not because it massaged my ego (although that’s always a bonus!) but because I have stuck my head above the parapet on this one- it’s a totally new concept/ approach and one that many brands just don’t immediately see the benefits of. They just look at my social media figures and discount me as I haven’t got thousands of followers. I am trying to get them to see it’s not about MY figures- it’s nothing to do with social media presence (for once! ), it’s about using my advise to help THEIR customers. To read your comments and see that I am right to have this hunch was just such a relief and spurs me on to keep hammering on doors! I showed the comments you sent to the team at Baukjen and they were SO receptive; absolutely fascinated to see what their existing customers as well as new customers were saying about their brand and designs as well as their partnership with me and the value you saw in it. Please keep them coming if you feel you have any constructive feedback for me / them, as the whole point in this exercise is to help you – so tell us what you think. Just email me back! Thank you again and have a lovely weekend.